So what does this mean for the AT class of 2017? Are there going to be some hopeful hikers prevented from experiencing Katahdin via the Hunt Trail (the AT) because there may not be enough permits to go around. For now the answer appears to be maybe. Let’s look at BSP’s own numbers to try and put the impact of this new policy into perspective. According to the release posted on BSP’s website the number of permits available for the 2017 season will be capped at 3,150, which is 417 more permits than they issued in 2016. That comes out to about a 15% increase in the total number of permits available for 2017. However, the same problem causing most of the current issues facing the AT is also at play here: the trail’s ever-growing popularity. Baxter State Park Authority (BSPA) cites that over the past 25 years the number of long-distance hikers using the park increased an average of 9% annually. However, between 2015 and 2016 that figure stood at 23%. In essence, if a similar rate of growth continues for long-distance hikers in 2017 as it did in 2016 it means there may be a couple hundred hikers who could miss out on a traditional Katahdin experience. Of course, all of this should not come as a surprise as tensions between BSPA and the Appalachian Trail Conservancy (ATC) have been growing for some time. In recent years, as the popularity of the AT has continued to rise, the BSPA has felt that the increased traffic and abuse is out-growing their capacity to manage the impacts the AT community has on the park. Many would agree that these tensions finally came to a head in 2015 with the highly publicized controversy between the BSPA and ultra-marathoner Scott Jurek. These events worry many in the AT community as the BSPA is under no obligation to permit the Appalachian Trail to run through its borders. The BSPA’s mission, above all else, is to preserve and protect the land they oversee, not to provide recreational access. If they so choose the BSPA could demand the AT be rerouted around the park effectively removing Mount Katahdin as the northern terminus of the trail; a proposal that has been floated more than once. Fortunately, for now this seems to always be treated as a hypothetical worst-case scenario to be used as a last resort. In response to previous year’s events, in 2016 the BSPA enacted the permitting system for long-distance hikers entering the park to better track the numbers of AT hikers crossing their borders. Now in 2017 placing a cap on these permits seems like a natural evolution. How these changes will impact the 2018 season remains to be seen and will likely be influenced by 2017 numbers. To read the park’s official statement click here. “The Appalachian Trail Conservancy (ATC) does not agree with Baxter State Park’s (BSP) new Appalachian Trail Long Distance Hiker Permit System, which limits the number of long distance Appalachian Trail (A.T.) hikers that can access the northern terminus of the Trail on Katahdin each year. Read their full response here. My name is Kenny but you can call me Bottle Cap. In 2013 I came down with a bout of Springer Fever and left my job to wander the Appalachian Trail with my fiance (now wife) Fun-Size. Since leaving the trail Fun-Size and I find ourselves trying to make life work in southern California while still maintaining our love for long-distance hiking. So many trails, so little time. I wish everyone would just stop mentioning Jurek. He wasn’t a thru-hiker, and the 12+ citations he and his support and production crews received are tangential to the entire issue. Please remember the Park Director’s letter to ATC outlining concerns came several months before Jurek Inc.’s violations of agreements with the Park, and their selfish and disrespectful behavior occurred. 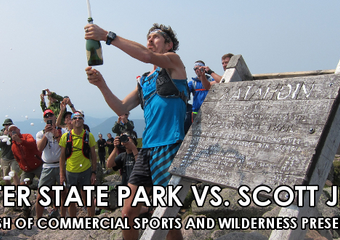 Scott Jurek is greatly to blame for this situation as his actions really upset Jensen Bissell and the authority at Baxter State Park. The ATC is also to blame due to poor leadership by Ron Tipton who has his head in the clouds. If you read the meeting minutes that Baxter has online it’s obvious the disdain and hatred towards AT thru hikers is real. Their goal is to remove the hikers from the park completely. This will not be allowed to happen, as their recent ruining betrays their own rules in Maine. All they are doing is risking eminent domain seizure of the park by the Trump administration which is our “nuclear” option if they ban the AT from the park. They have far more to lose than they think. The Park director’s letter to ATC came several months before Jurek Inc.’s violations of their agreements with the Park. Jurek, despite his desire to play granola crunching victim, has nothing to do with the unsustainable increases in AT traffic. The Park will, and should, eventually stop giving special treatment to ATers. Discounted fees, special AT only site, AT-only dedicated staff, not needing 4 months in advance reservations like everyone else. Close the Birches. Have ATers follow the same rules as all other Park visitors. As fellow hikers, maybe we share some of the blame, even if only a small fraction. Sure, the ATC has been way behind the curve when faced with the explosion in hiker numbers. In addition, BSP has been open about the desire of their leadership to eventually do away with the AT in their precious park. Maybe if we had taken a more active stance when it came to policing our own, we might not be faced with this growing dilemma. This problem largely relates hikers who have, through their behavior, expressed the apparent belief that dropping out of society for 6 months means they no longer need to conform to basic accepted societal standards. Bad behavior will never be none existent if that is what you man by “dealing” with it. There is an appropriate way to respond when incidents happen, but to think we will ever irradiate bad behavior completely is foolish. When we successfully do that, humans will be extinct and AI will take over. People are incapable of any level of tolerance anymore, including me. And I hate to break it to, nothing you knew will be as you knew it for the next generation. All these things you seem to dislike are exactly what life is. Life is fragile and ever changing. 99% of the trail is no longer the original trail. But I do agree we are far to polite in the moment, and then far too critical after the fact. Cubicle mentality driven by the herding of HR to all but a few companies, all with the same agenda. Please, lets find a better approach at addressing these issues, without sounding like a rule is required to eradicate every possible mistake. Let life be temporary and a lesson, do not rob others of that as we once had it. Without that, we lose part, if not all, of the beauty of life. I am a Thru hiker, I journeyed thru in 2015. I am also a long time member of the ATC, until January of 2017 that is. I will no longer support the ACT for the one reason that they heavily over promote this wilderness trail. One good example of this is the book and movie ‘ A Walk in the woods’ by Bill Bryson, a man who never thru hiked the trail. He has led so many people to believe he did and that it is simple to do, thus sending hundreds of people to the trail under false presentation to temporary clutter up various sections of the trail. I will continue to be a trail maintainer for various local clubs. A Walk in the Woods came out 19 years ago about a 22 year old experience and was a strong seller for like 2 years. I remember because it was on the NYT bestseller list still when I got a job at a bookstore after high school. And you haven’t seen 25% popularity increase for the last 20 years on the AT. I guess you could throw some shade on the movie version if you wanted to as the timing is sort of right, but probably Wild and Mile Mile and A Half are more responsible for the surge of interest in long distance hiking in general. We should all respect the land, but the Indians before us did not need land ownership to achieve this. In fact, quit the opposite. SO who owned the land and left it to whom seems irrelevant to me. Perhaps our concept that we own the land is exactly the problem, not the solution. Perhaps we should revisit our morals on things of this nature if we expect the people within our society to “behave” in certain ways. Our attitudes of borders and keeping each other is what fosters such bad behavior, not ends it. Yes, we do have a overcrowding situation on the Trail. Also exacerbated at BSP by Mr. Jurek (but the problem was there long before he arrived). ATC has been working to educate hikers about appropriate behavior trail-wide (because it’s a trail-wide issue), and at BSP in particular. Good behaviour–and reports last year seemed to indicate that most hikers were respectful–can help minimize impacts from high numbers of hikers–but can’t change the fact that there are a lot of us–and we arrive at the same place, pretty much at the same time. Not sure what ATC or the National Park Service can do about the number of hikers on the AT in BSP (and not all of them are thrus). ATC does not publicize BSP or the 100 mile former ‘wilderness’–there are plenty of other ways for people to find out about the A.T. (including The Trek). The only real way to reduce the number of users on the Trail is to limit who can use it at specific times and locations–typically via permitting (which is how the PCT is managed, for instance). Even if one could accept the notion of limiting access to the country’s most iconic trail, the practicalities of effective enforcement are daunting. 100’s of road crossings, little to no enforcement personnel on the trail checking for permits, an uncontrollable access to information about the A.T.–some of it accurate, some of it not so much. Would any of us be willing to hike someplace else to take the load off the A.T.? Doubtful. I think there could be ways to manage use in BSP that are more sophisticated than a simple cap on total numbers. AT hikers could be required to be off of the summit by noon, or not on the AT on weekends in August and Sept are a few that leap to mind. Analysis and study of the actual timing and numbers of hikers collaborative by all parties would be the first step in developing a solution–something BSP as so far refused to do (which is their right). I know it’s probably not a popular option but why not use the new hiker registration the ATC started? The ATC and Baxter could work together here where if you’re finishing up a section hike that year, flip flopping or thru hiking and baxter only allows those in that registered? Obviously there would have to be some flex here, especially if you start as a thru hiker and then change to a flip flopper. If you don’t register as a hiker through the ATC, you don’t get into baxter as a thru hiker. Sounds crazy but it might work. I also see a lot of people “thru hiking” starting by going to Katahdin first and then immediately going to Georgia to start and then finish right before baxter. Also, again, might not be a popular opinion but if you don’t register through the ATC you don’t get recognized with your name in magazine or certificate…. You’re right, a NoBo calculating 4 months in advance when they will crest isn’t practical. Now everyone will get to experience black fly season. Several suggestion of schemes to limit the peak flow of AT thru-hikers to Baxter Peak are suggestion of how to handle the symptom. The actual problem is the size of the spring rush from Springer. Management (limitation – permits) here would address the problem of too many thru hikers on the trail for the entire length of the trail; also would negate to experience of a failed thru-hiker effort at the boundary of the BSP due to denial of an entry permit to finish the last ?12miles of trail. Manage the high flow at the source. Then what’s an aspiring thru-hiker to do if he/she is unable to gain a permit to start a NOBO hike? The are plenty of other trails of all lengths up and down the eastern states and across the US. With that one management intervention – at Springer – you have both lightened the use on the AT, on the BSP, and have promoted dispersal of use the the many other trail, some in need of a following to thrive. I live in PA and was thinking about heading south from here first, and then coming back and heading north. Heading against traffic is not very appealing sounding, and timing the seasons right do not necessarily fit into this and my schedule. I may try to leave in Feb from Springer, but will likely need to time that based on weather in the Smokey’s. I am still in early planning, but I am seeing there is far more logistics to think about than I realized. Best practices in wilderness management is to concentrate impact in heavily used areas and spread out impact in lightly used areas. The increased used in Baxter pales in comparison to what is dealt with in the popular national parks like Yellowstone, Yosemite, Grand Canyon (5.5 million visitors in 2015), and Great Smokies (307 million visitors in 2015), who see literally thousands of times more people than Baxter each year. All of these and other parks made the transition from remote wilderness areas to heavily visited destinations with careful management, even though it was not always graceful. There are paved pathways, highly developed tourist areas, parking lots, large campgrounds, stores, etc. in the areas where lots of people go, and then other places are designated as wilderness backcountry with much tighter restrictions and fewer people allowed. It is NOT true that the only mandate of the park systems (national or state of Maine) is to preserve. In that case all human use would be instantly cut off. The mandate is broader and includes education, recreation, public enjoyment, inspiration, and of course preservation. All parks work hard to find a balance of those core values by welcoming all who want to come and creating space for them in places where they concede there won’t be true wilderness (think south rim of Grand Canyon or Yosemite Valley). The way that parks handle increased popularity is NOT to limit people, but to build infrastructure that concentrates and can handle them in limited places. Yosemite Valley was once true wilderness and that is a heartbreaking loss. But sacrificing the wilderness in that one location serves to preserve the rest of Yosemite, and is a vastly superior option to either turning people away or letting them do whatever they want wherever they want. Baxter should recognize that the AT corridor up Katahdin is no longer pristine wilderness because people want to experience it. The wilderness experience is diminished compared to the past because of its popularity, but best practices would dictate that the popular use areas here be developed appropriately to handle the pressure, while setting careful management limits elsewhere to preserve the wilderness there. Just a quick “Yea” to the suggestion of ATC registered thru-hikers allowed into BSP: I think it’s a great way to ‘monitor’ all thru-hikers. Just a day hike there is almost no worth the hassle and trouble they give you. They only allow so many day hiking saying parking is full. But vehicles in front of us one of which was a group we were with but got separated on the way. Said that they was plenty of Parking just that they put a cap on for the day and we had to wait almost half the day. Bsp is not like any other park on the AT. Very unfortunate that they would bring such hatred toward thru hikers. Everywhere else sure encourages you and try’s to comfort you some how. Here; the ending should be the most friendly and welcoming.